After watching the scene more than a few times, my guess is it that Rey is served a raw fruit salad (with grapes or olives and romanesco, among other things) in a hollowed-out apple. But for all the raw veggies we eat at our house, no-one in our family voluntarily eats raw broccoli or cauliflower, so modifications had to be made. 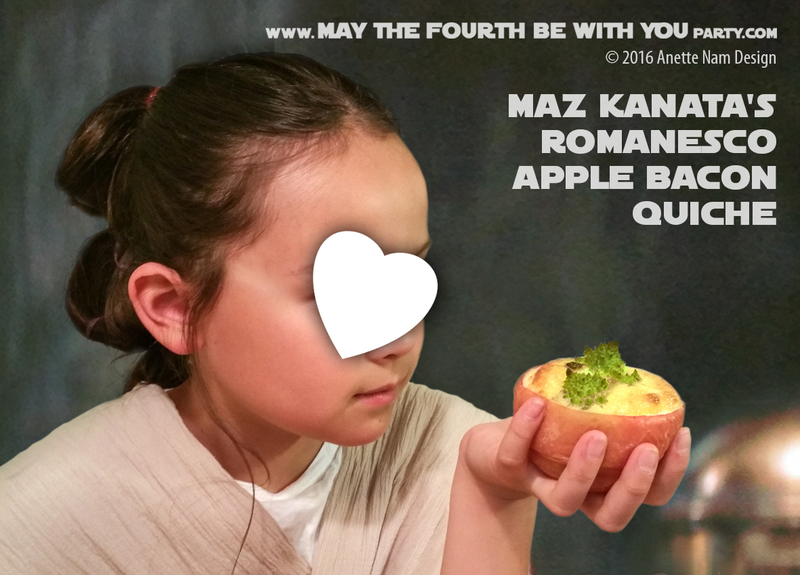 After some brainstorming and tinkering, I am proud to present: Maz Kanata’s Romanesco Apple Bacon Quiche! Mix cream, eggs and cheese in a bowl – let sit while you prep the other ingredients. Wash the romanesco, and cut into smaller fractals (about 1.5″ tall). Turn oven on to 350°F. Cut about 1/4 off the top (put those pieces aside). Hollow out the bottom sections with a small spoon, leaving about 1/4″ of apple inside the skin. Be careful not to punch any holes! Save all the extra apple pieces, you might need them later. Cook and dab the bacon with a paper towel to remove excess grease. Cut bacon into 1/2″ pieces. Place the hollowed-out apples in a muffin pan (if they are small enough) or wrap each in aluminum foil (leaving the top open). Put muffin pan (or the wrapped apples) on a cookies sheet to collect any bubbling over when cooking. Spoon the egg/cheese/cream mixture into the apples, layering with bacon pieces. Decorate each with a few tips of steamed romanesco. If there is any egg/cheese/cream mixture left over, spoon it in a second (greased) muffin pan, adding any leftover bacon, romanesco or apple pieces… these make great mini-quiches too! Just don’t cook them as long. Cook for about 30 – 40 min. The quiches should be golden brown and cooked through, but the apples should not fall apart. When serving, be careful so the apples don’t break. It is important that you let the cheese/egg/cream mixture sit for a while. It will thicken up a bit, preventing it from leaking through any holes or thin spot in the apples . The romanesco is really tasty! I love steamed broccoli, but really don’t like cauliflower at all. This tastes like neither, and makes a great side dish all on its own. I find it very amusing that they use a fractal food in The Force Awakens, since the movie is almost a fractal in itself: a re-telling of a common story, which in turn is part of a larger repeating story arch. I would assume this is on purpose. If you have not read the Star Wars Ring Theory by Mike Klimo, you absolutely should. His theory (which could just as easily be called Star Wars Fractal Theory), talks about how the 3 original movies and the 3 prequels work together, how they mirror each other, and create a larger repeating story arc. This looks awesome! I am going to have to do this! Thanks for coming up with this and passing it on! This will be so fun to do with a star wars movie night!